While the ten-year anniversary of Hurricane Katrina striking New Orleans is being marked this weekend, Carnival Cruise Line is looking ahead to how much they’ve grown since they returned to the Crescent City after the storm. The complete story appeared in the August 28 edition of Cruise News Daily. The track for Tropical Storm Erika is sliding west from the original forecast, and may now miss the ports of South Florida completely, although they should still expect to get some residual wind and rain. Local Florida forecasters continue to downplay the storm’s effects on the state. The storm’s vital signs are now technically below tropical storm status, but it is expected to strengthen slightly as it crosses the Florida Straits. Port Canaveral wants to handle more passengers, but this time not by building an additional cruise terminal, but rather by renovating two of the terminals they already have. On Wednesday, port commissioners approved a $90 million financing package that will allow the port to renovate two cruise terminals to handle larger ships (which they already have booked) and more passengers, and to build a new parking ramp to accommodate the additional passengers. The complete story appeared in the August 27 edition of Cruise News Daily. The Coast Guard has put Port Miami, Port Everglades and the Port of Palm Beach on Condition Whiskey as of 8pm Thursday evening, meaning they expect gale force winds (39 to 45 miles per hour) within 72 hours. The ports are told to prepare to go to Condition X-Ray status (the next higher restriction of operations) at 8pm on Friday. This is, of course, in advance of Tropical Storm Erica covering South Florida on Monday morning. Local forecasters are feeling less sure of severe conditions than the National Hurricane Center. Cruise lines are reflecting this uncertainty at the moment. Details appeared in the August 27 edition of Cruise News Daily. Royal Caribbean has released a new video that gives you a look at something most passengers never see: the Azipods under their ships that propel it. Be prepared to watch this video twice because a lot of information is coming at you in just two minutes. So Carnival Pride will be leaving Baltimore for a couple of months (January and February) during the winter of 2017 and coming home to Tampa with several itineraries to choose from. Details appeared in the August 26 edition of Cruise News Daily. Lots of lines have “behind the scenes” tours of the ship, but only Costa will teach you how to be a captain - and even let you dress the part. There’s just one catch: You have to be a kid. 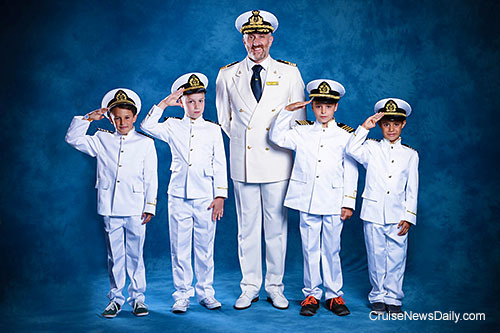 The “Captain for a Day” program begins with donning your captain’s strips (yes, the kids wear a small captain’s uniform) and ends with dinner at the captain’s table with the master of the ship. The complete story appeared in the August 26 edition of Cruise News Daily. After already canceling Celebrity Equinox’s overnight calls at Istanbul on August 23 and 24 (and giving the ship just enough time for a turnaround on August 24), Celebrity has decided to cancel Celebrity Reflection’s entire two-day visit on September 4 and 5. Again, security concerns were cited at the reason for the cancellation. (Washington, DC, August 26, 2015) – Cruise Lines International Association (CLIA) announced that Marla Phaneuf has joined the organization as Vice President, Strategic Partnerships, North America. Phaneuf will be responsible for CLIA’s strategic alliances and work with partners to ensure member engagement and satisfaction. Phaneuf brings more than two decades of leadership experience to the role and joins CLIA from Celebrity Cruises where she served as Team Director for the New England region. At Celebrity Cruises, she worked to build brand awareness and has an extensive background in generating new business and increasing sales. Prior to her role at Celebrity Cruises, Phaneuf worked at the American Automobile Association (AAA) and owned a travel agency. “Marla’s drive and passion for building successful partnerships and teams, coupled with her impressive background in the cruise industry, will be an incredible addition to our team,” said Cindy D’Aoust, Acting CEO, CLIA. As Vice President of Strategic Partnerships, Phaneuf will oversee all business development and retention strategies, including identifying and marketing the value of CLIA to potential Executive Partners. She also will develop strategic marketing alliances with organizations that focus on CLIA North America travel agent community. According to a new survey by MMGY Global, even Mick Jagger could get satisfaction on a cruise, because satisfaction with cruising is running at an all-time high. The complete story appeared in the August 25 edition of Cruise News Daily. Norwegian Cruise Line and Crystal Cruises opening their new products for sale to the general public today. Details appeared in the August 25 edition of Cruise News Daily. Technically, Celebrity Equinox’s call at Istanbul wasn’t canceled today, but the call was modified drastically for security reasons. Istanbul was the turnaround point for the ship, and it was scheduled to arrive on Sunday with passengers on the last cruise spending the night aboard the ship in Istanbul and disembarking Monday. A new group of passengers was to board today, giving them the night and some of Tuesday in Istanbul before the ship sailed at 1pm on Tuesday. It didn’t happen quite like that. The complete story appeared in the August 24 edition of Cruise News Daily. Even though Hurricane Danny is a relatively small storm, its path straight through the eastern Caribbean has caused cruise lines to shift ships’ itineraries from eastern to western Caribbean routes. The time of the year, with many ships out of the Caribbean, has limited the number of changes. Details appeared in the August 24 edition of Cruise News Daily.